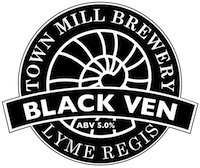 Town Mill’s Black Ven | DorsetBreweries.com - A Guide to Dorset Breweries and Dorset Beers! Brewed using Pale, Crystal, Black and Chocolate malts together with Bobek and Bramling Cross hops. A dark brown porter with a pronounced depth of flavour, enhanced with the blackcurrant fruitiness of the hops.